Download the sample code and data here or link to it directly at Art's SAS Press author page. There are several hundred references to other books and papers on the macro language cited in the book. The Reference section including active links has been uploaded. View the PDF of the References here. Reviews of this book can be found here. Please feel free to add your own review. Far beyond a reference manual issued from an "ivory tower," this book is pragmatic and example-driven: Yes, you will find syntax examples; yes, the code is explained. But the focus of this book is on actual code used to solve real-world business problems. In fact, an entire appendix is dedicated to listing the nearly 70 classes of problems that are solved by programs covered in this edition. Discussion of the examples elucidates the pros and cons of the particular solution and often suggests alternative approaches. Therefore, this book provides you both a compendium of reusable and adaptable code, and opportunities for deepening your understanding and growing as a SAS programmer. 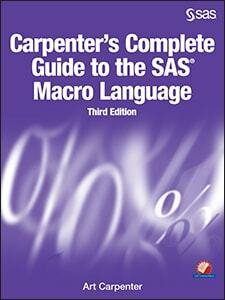 The macro language has a number of similarities to the language that is used in SAS DATA steps. In order to maximize the usefulness of the examples in this book, you need to be able to build on these similarities. Students unfamiliar with the DATA step should first take a basic programming course in SAS such as SAS® Fundamentals: A Programming Approach (offered by SAS Institute Inc.) or an equivalent course. be able to use macro statements within SAS macros. This page was last modified on 31 August 2016, at 23:31.